TSP Legal > News > General News > What is a Grant of Representation / Probate? What is a Grant of Representation / Probate? Sarah White, a Clacton-based Associate Solicitor in the Wills and Estates team at Thompson Smith and Puxon, discusses Estate Administration or Probate as it is more commonly known. Administering a deceased person’s estate can be a complicated, emotional and stressful job. The time it will take and the level of complexity and resulting costs will depend upon the nature and size of the deceased’s estate and the terms of any Will or the impact of the rules that apply when someone dies without a Will – the Rules of Intestacy. If the deceased person left a Will then it is the executor(s), named in the Will, who are entitled to administer the estate, and all the assets of the deceased pass to the executor(s) to deal with. If there is no Will then the person or people entitled to administer the estate, called the Administrator(s), will be, in order of priority, a surviving spouse or civil partner, adult children, and then the parents of the deceased. The size and nature of the estate will determine whether it is necessary for the Executor(s) or the Administrator(s) to apply to the Probate Court for legal authority to deal with the estate, e.g. to release money held in bank accounts, sell shares, transfer or sell a house. This legal authority is called the Grant of Representation, specifically a Grant of Probate if there is a Will and a Grant of Letters of Administration if there is not. The application can be made in person to the Court, which may require attending Court for an interview. However, if you have instructed a solicitor to deal with the estate then attendance at Court is not required and the application can be submitted by the completion and swearing of an Oath, which we will arrange, in the presence of an independent solicitor. 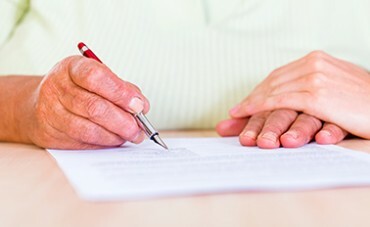 Instructing a solicitor at this stage to help in administering the estate also gives the advantage of having an expert to gather the appropriate information and complete the application forms and Inheritance Tax declaration, gather in the assets and carry out the instructions in the Will or follow the Rules of Intestacy. We can also deal with any challenges from HM Revenue & Customs and questions from potentially disappointed beneficiaries. For more advice in this area or for Wills and Lasting Powers of Attorney Sarah can be contacted on sarah.white@tsplegal.com or by telephone on 01255 254265. Home Visits:If you are registered disabled or physically unable to get into our office to see us then we can visit you at home, in hospital or in care, and will not charge extra for travelling to see you. If it just suits you better for us to travel to see you at home then we are happy to do this but will need to charge an additional fee which we will discuss with you when you contact us.